Basic Format: Author, A. A. (Publication Year). Title of work: Subtitle of work. Place of Publication: Publisher. Smith, P. (2002). Cut to the chase. Online video editing and the Wadsworth constant (3rd ed.). Washington, D.C: E & K Publishing. Massaro, D. (1992). Broadening the domain of the fuzzy logical model of perception. In H. L. Pick Jr., P. van den Broek, & D. C. Knill (Eds. ), Cognition: Conceptual and methodological issues (pp. 51-84). Washington, DC: American Psychological Association. Bergmann, P. G. (1993). Relativity. In The new encyclopaedia Britannica (Vol. 26, pp. 501-508). Chicago, IL: Encyclopaedia Britannica. Note: Most examples are from the Publication Manual of the American Psychological Association. 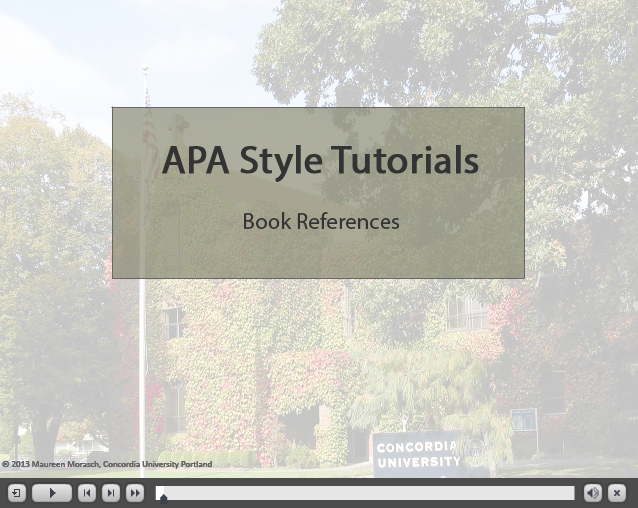 See section 7.02 (pages 202-206) of the Publication Manual for the American Psychological Association 6th edition for additional information and examples.